PT Kimia Farma (Persero) Tbk - Kimia Farma is a leading state-owned healthcare and pharmaceutical company in Indonesia. Headquartered in Jakarta, Kimia Farma concentrates its business activities in diverse business categories, such as pharmaceutical manufacturing, trade and distribution, pharmaceutical retail and international trade. 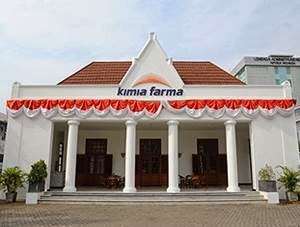 Kimia Farma is a public-listed company and registered its shares in Indonesia Stock Exchange (IDX) with stock code of “KAEF” (listed since July 2001). At present, Kimia Farma is 90.025% owned by the Government of Indonesia, 0.152% by management/employee and other remaining sahres was owned by public. Kimia Farma now has 5 directly-owned subsidiary and affiliated companies, namely PT Kimia Farma Trading & Distribution, PT Kimia Farma Apotek, PT Sinkona Indonesia Lestari, PT Kimia Farma Diagnostik and PT Asuransi InHealth Indonesia. As of December 2015, Kimia Farma has 5 pharmaceutical plants, 47 trading distribution branches, 725 pharmacies, 43 laboratory clinics and 315 medical clinics throughout Indonesia. According to PT Kimia Farma (Persero) Tbk Annual Report 2015 as quoted by JobsCDC.com, Kimia Farma is running well in the full year of 2015. Total sales in 2015 amounting to Rp 4,860.37 billion, or a growth of 7.51% of total sales in 2014 amounting to Rp 4,521.02 billion. While net income in 2015 amounting to Rp 252.97 billion, or 6.95% higher than the previous year of Rp 236.53 billion. Willing to work hard in highly dynamic and demanding situations. JobsCDC.com now available on android device. Download now on Google Play here. Please be aware of recruitment fraud. The entire stage of this selection process is free of charge. PT Kimia Farma (Persero) Tbk - Fresh Graduate Pharmacist Kimia Farma July 2016 will never ask for fees or upfront payments for any purposes during the recruitment process such as transportation and accommodation.